Awaken. Simply saying the word stirs something inside of me. 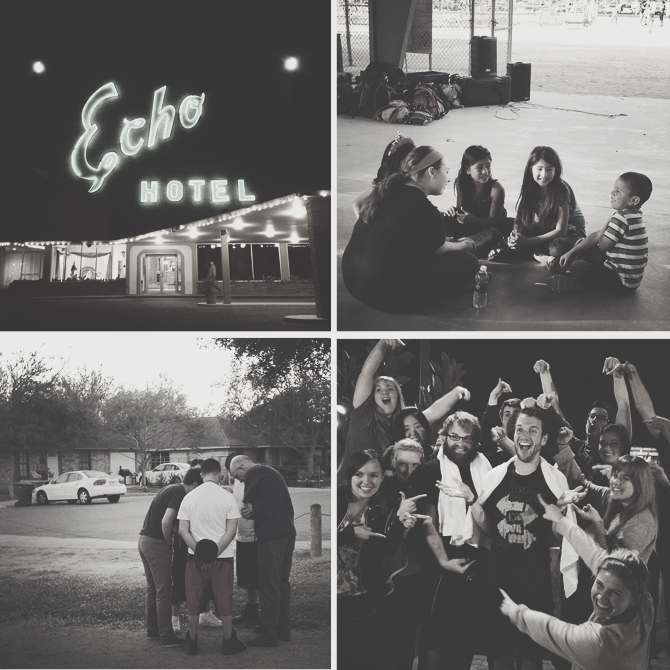 Awaken is the name given to Antioch Community Church's college ministry's annual spring break mission trip to south Texas. This was my third year to go and while sooooooooo very different from every other experience, it was still life-changing and a complete gift from God in this time in life. I led our section's drama team with my good friend Adam. Our small but mighty team of 9 (mostly freshmen) lived up to the nickname "varsity squad" if I do say so myself. But it goes beyond producing quality work. It is trips like these and experiences like we had that remind me about just how powerful theatre is. A ten minute skit can absolutely share the gospel and surpasses language barriers that would otherwise remain untouched. Our big team was small but mighty as well. My first time on Awaken we had 90+ people, often crammed onto a school bus chanting "Four to a seat! Four to a seat"! Sorry, Mom. We were completely safe, I promise! This year the 32 of us fit comfortably onto one bus and were even able to take in a few "bonus bus" students from other sections. A highlight from the trip was seeing our team become a family and watching the freshmen come alive! The breakthrough they saw in their lives, the thrill they found at spending time with Jesus each morning and diving into His Word and work the rest of the day-- oh man! Makes my heart so happy! Going into the trip, I knew the routine pretty well --it never changes too much-- but it was still so refreshing and kept me going so the week flew by. 5:15. My alarm goes off. I bolt across the room, tripping over everything, to hit the snooze. It is usually tragic and I mumble apologizes under my breath as I search for the clock, but finally it quiets. 5:30. I am hopefully out of bed this time and getting into the shower. Mornings don't exist for this girl unless I've been pelted with hot water and washed my face. 6:00ish. The "ish" is very important here. I found myself a table and chairs in a corner of the parking lot and spent my quiet time there. It was fun to see people from my team and others out and about reading the Word and worshiping as the sun came up, too. 7:10. Those of us staying at the Executive Inn challenge traffic and high-tail it across the street to The Echo for small team leaders' meeting. And when I say challenge traffic I really mean wait FOREVER for the lights to change. I'm a stickler for waiting for the "walk" signal. 7:50. Breakfast with the entire team. Oatmeal & brown sugar, amazing biscuits, and plenty of milk. But really, I drank so much milk and was made so much fun of for it. Oh well. 8:45. Big team round up. Team 24601 (#redeemed) gathered in the parking lot then hurried across the street to the activities center. We always sent a few of the boys to the front of the line to snag our seats in the front. It didn't always work but we sure tried. 9:15. Morning sessions! Always incredible, amazing speakers, extended worship, etc. Really such a blessing and a great way to start the day. -----lunch on the bus on the way to a service project. -----lunch in the parking lot waiting for the bus to go to a service project. Afternoons. Time is vague here too. Some days we would have service projects where we would clean up a neighborhood and go door-to-door seeing if anyone needed help or had a way we could pray for them or serve them. Other days we would have break out seminars at the hotel. I went to Women of God and World Changing Discipleship. Both SO GOOD! Evenings. Every night we would do an outreach. This meant going to a neighborhood, church, or park and doing a "set." We would go out and meet people in the area and invite them back to our home base where we would have games for kids and then do a dance and a drama before sharing the gospel. God was so faithful and we saw so many salvations! People's lives were changing right before our eyes! Nights. After dinner --also, always delicious-- we would have big team time where we shared testimonies about the outreach. We would also have a time of encORANGEment. This started on day 1 where someone threw an orange at another person and encouraged them out loud in front of the group. We did this for 5-7 people every day until the entire team had been encouraged. 10:30. Curfew. In your rooms. And there is your average day on Awaken! I am still processing so much of what happened, so be prepared to hear about this trip for the next few weeks. Also, I've a fun adventure coming up this weekend that I cannot wait to share with you! How was your spring break?? I'd love to hear about it! Wow! What part of South Texas (san antonio??) :) I did two Spring Break community service type trips in college and they were the best.